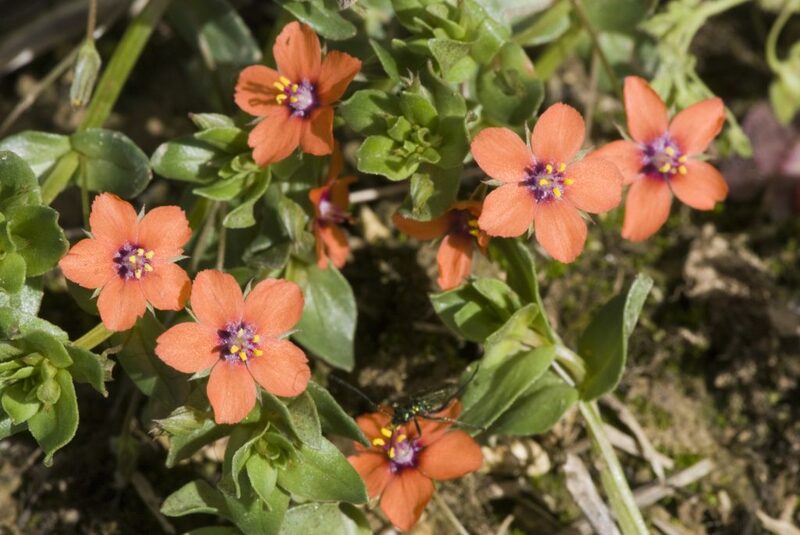 Anagallis arvensis is a sprawling annual, 10-30 cm long, much branched, stem 4-angled. Leaves opposite, elliptic to egg-shaped, 1-2 cm long, unstalked (sessile), each pair at right angles to next. Flowers red-orange, about 0.6 cm wide, regular, 5-parted, long-stalked, closing in bad weather; blooming and fruiting June-Aug.
Fruit dry, hollow, a rounded capsule, splitting open around middle to release seeds. Habitat: Open or partly shaded weedy areas, gardens, lawns, edges, rather salt tolerant.